Sometimes, a concept is the worst thing that can happen to an episode of television. “The Over-Correction” puts its concept right out front: a slamming-doors farce with all the characters trying to escape from Barney’s apartment while he’s decorating a tree with Patrice. I’ve got nothing against this kind of classic theatrical setup; done well, it’s a slam dunk. Done without the careful yet chaotic escalation the form requires, it’s a snooze. 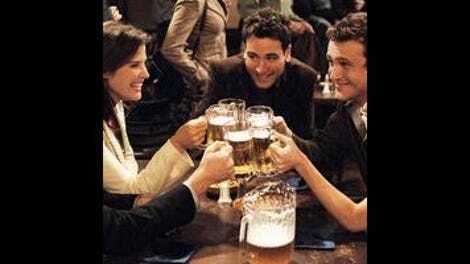 And done half-heartedly on HIMYM, it unfortunately recalls last season’s nadir, “The Burning Beekeeper”—a bottle episode that masked its lack of heart with formalistic hand-waving and temporal calculation. The pile-on in Barney’s suite of closets begins when Robin decides she needs to show Patrice Barney’s playbook, in order to prove that Patrice’s “honeybear” is a stone cold ladykiller with no scruples. So she breaks into Barney’s apartment and triggers various secret compartments (all of which open with the sound of angelic choirs) containing leather-bound copies of the Bro Code, David Lee Roth’s autobiography Crazy From The Heat (“to the best wingman ever, we’ll always have Panama, Diamond Dave”), and finally, the Playbook. But she has to do this while evading Barney who’s prepping for his night in with Patrice, and while hiding in the wardrobe she calls in Ted as reinforcement to distract Barney while she makes her escape. Long story short, Ted tries to sneak in to retrieve Robin’s purse and winds up in the utility room. Lily, meanwhile, was already there because it turns out she had been using Barney’s apartment as a place to pump breast milk in peace, away from her dad and Marshall’s visiting mom. Throw in Marshall barricading himself from the sight of Mickey and Judy doing it in Marvin’s nursery, and the only character not huddling among boxes and overcoats is Barney. That “long story short” up there contains the best moment of the episode, and one that should go on a season eight highlight reel: Ted tells Barney that Hugh Hefner is in his building’s lobby, news that sends Barney tearing through the apartment in full Jerry Lewis mode yelling “I’m gonna grab my roooooobe!” And it’s not like the writers think the farcical situation is enough to generate laughs on its own. They construct a reliably amusing running gag about all of the belongings the gang has borrowed from Ted over the years, which turn up throughout the episode, despite their denials of responsibility. Lily has Ted’s Cleveland Chamber of Commerce mini-cooler and his high-school era “Vote for Ted” hoodie (“Mrs. Gooding said my concession speech was quote ‘full of grace’”). Robin has his Weekend At Bernie’s special edition DVD and pocketknife, a pocketknife that she uses to menace the red cowboy boots that coworker Stuart gave back to Barney to return to Ted. Barney also has Ted’s Christmas ornaments, garbage can, and best of all, the label-maker used for the futile purpose of labeling nearly all these items PROPERTY OF TED MOSBY. “The Over-Correction” also features multiple scenes of Robin screaming at Patrice (“Why won’t you let me help you, Patrice!”), a motif that has only improved with repetition. But the emotional arc that is supposed to undergird all this scurrying-about is missing in action. It’s not Cobie Smulder’s fault; she plays as much manic desperation as she can with the material she’s given. The material simply doesn’t acknowledge the mixed emotions out of which that desperation emerges. Robin refuses to admit that Barney might be getting something he needs from Patrice; to her, Patrice is an over-correction, a swerve away from the ultra-sexual stripper Quinn to the unthreatening, motherly Patrice. The humiliating moment that ended last week’s “Lobster Crawl” hasn’t led to any introspection, or even to a spiral of self-pity. Instead, the writers have Lily tell Marshall and Ted about it (explained and dismissed in one joke about her inability to keep a secret) so that they can matter-of-factly discuss with Robin how she is acting like a crazy person after being rejected. I’ve made it very clear that I am not bothered by the slow, winding march toward the wedding, with its inevitable boy-loses-girl then girl-loses-boy temporizing. These couplings and reversals, and the intense soul-searching and tea-leaf-reading that accompanies them, are part of the fabric of finding intimacy and romance among long-time friends, as I argued last week. So I’m not objecting to the concept of Robin obsessing over Barney’s relationship with Patrice and finally becoming the target of an intervention. (“Please tell me this is about my drinking,” she begs.) I object to the shallowness of the way it’s presented, not allowing Robin any layers of regret, any flashes of clarity, any emotions that she has to tamp down or twist into knots in order to carry on. No, for the big episode concept (Trapped In The Closets) to work, she has to be simplified. And that goes against everything this season has worked so hard to craft. Other over-corrections: After breaking up with Victoria, Ted dated a convict; Marshall went Dice Clay and then Chris Rock when told his fish-based comedy needed to be edgier. After shocking Patrice with the “Two Can Play At That Game” move from his playbook (tell a woman her husband is sleeping with your wife and then hint “I wish there was some way we could get back at them”), Barney tosses the book in Ted’s garbage can and burns it. Lily’s advice to Judy on dressing to impress men: Get rid of all the sweaters with horses on them. Yes, even the ones that have manes with real horsehair.